Dental implants are false teeth used to replace missing teeth. The come in three parts: the titanium stud, the abutment and the cap. When you are missing a tooth or teeth, you need to put something in that empty socket or you will have problems with your jaw bone shrinking. This will cause health problems overall. Dr. Savage will determine whether you need a dental implants in Redwood City or not. 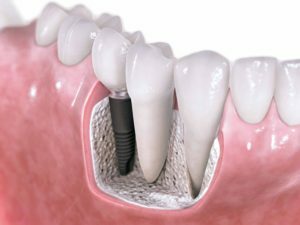 Dental implants’ cost in Redwood City is based on the cost of the surgical procedure, the materials used and the length of the process. Although dental implants in Redwood City might not be inexpensive, they are often the better solution and more long-lasting. We work with you and your insurance company to present to you the most reasonable rate possible for a dental implant procedure. We accept several insurance plans and develop a fee structure in line with recommendations from other dentists and insurance companies. The advantages of dental implants are many. Without dental implants, you will have a hole in your mouth. Eventually, your jaw will shrink and close that space, which will cause your facial muscles to sag. You will have trouble talking or eating without dental implants. Even though you can replace missing teeth with dentures or bridges, dental implants are more secure and longer-lasting. In addition to this, they are very easy to maintain and require no extra effort. Plus, your overall over health may also improve with the help of dental implants. Dr. Savage will provide you more benefits of dental implants when you visit our dental office in Redwood city. Dentists start the dental implant procedure by preparing your gum line and jaw bone. They insert the titanium screw into your jaw. Then, the patient has to wait until that surgery heals and the jaw accepts the screw. When the screw and jaw fuse together, the dentist adds the abutment, which is the part seen outside the gum line. After another few months, the dentist fits the implant crown over the top. Dental implant complications include problems associated with not having enough bone structure to perform the procedure or rejection by the jaw of the implant. Still, with a 98% success rate dental implants is the best solution to missing teeth. You might experience mild dental implant pain. You also might experience pain in the gums and jaw bone. Dental implants after effects also involve infection getting in the surgical site or the gums. However, with the help of medicines prescribed by Dr. Savage you can easily overcome these minor dental implant complications. Talk with your dentist about other dental implant possible side effects. Missing teeth is no laughing matter. It can cause you serious problems. Visit your dentist in Redwood City at Redwood City Family Dentistry to get your dental implant. Come to 1130 Hopkins Ave. to have your dental implants. Call 650-367-8833 to make an appointment.